Last night got back from a late show of the movie Equalizer and couldn’t fall asleep immediately. One shouldn’t watch violence before bed time as sleep disappears. I decided to check out my facebook page and the first thing I see was the speech by Indian Prime Minister, Narendra Modi at the Madison Square Garden shared by a friend. A true leader, a great orator and a humble man. His speech captivated the audience and was inspirational. For a person who wants to do so much for India its every Indian’s duty inside and outside India to support this great cause. We all dream of a better, cleaner India and if we put our minds to it, it is possible. I am usually not interested in politics as everywhere in the world, politicians promise a lot and leave the people disillusioned. However, what I have noticed about Narendra Modi is that you cannot help but get capitvated by what he says. Today our mid morning host on the local Asian radio kept on saying again and again that no world leader has been able to attract so many people to the Madison Square Garden. Madison Square Garden is filled to this capacity only when there is a rock or pop star! I think after hearing this speech,she too has greater respect for him. Previously when listeners would praise the Prime Minister, she would voice her doubts about what he can achieve. It was difficult convincing her as she is orginally from Pakistan. But I guess today it was a different ball game as she was full of praises for him. Having so much faith in the youth of India should be a great motivator for them. It is also an eye opener to all the Hindus around the world that following ones religious belief does not mean we compromise it to suit others need. A few days back I read that the great chefs of White house were put in a dilemma as to what to serve Narendra Modi as he is fasting for the whole Navratri festival. They didn’t think it was right for the others to be served with scrumptious courses when their guest was fasting. I would really like to know how and what everyone was served on that day. So today I think it is befitting to post a Gujarati recipe. I decided to post my sambharo recipe. What is sambharo? Sambharo is like a warm salad made with the two main ingredients cabbage and carrot. To this you can add raw mango, raw papaya or capsicum. Sambharo is usually made as a side dish when making the whole Gujarati meal or it is served with papdi ganthia and jalebi as a Sunday breakfast or brunch. I love sambharo as the vegetables are not overcooked. I love to have it with roti, with papdi ganthias or on its own. Shred the cabbage, or cut into thin strips not too thin or not too thick. Peel the carrots and cut into into sticks about 1 -1½ inches long. Slit the green chillis lengthwise into 2. Add fenugreek seeds and then the mustard seeds. As the seeds begin to crackle, add the green chillis. Immediately add asafoetida and the turmeric powder. Mix and add the carrot sticks and cabbage. Add salt, mix and cover the pan. Reduce the heat. Cook for 3 – 4 minutes. Add sugar, lemon juice and chopped coriander. Mix and serve. 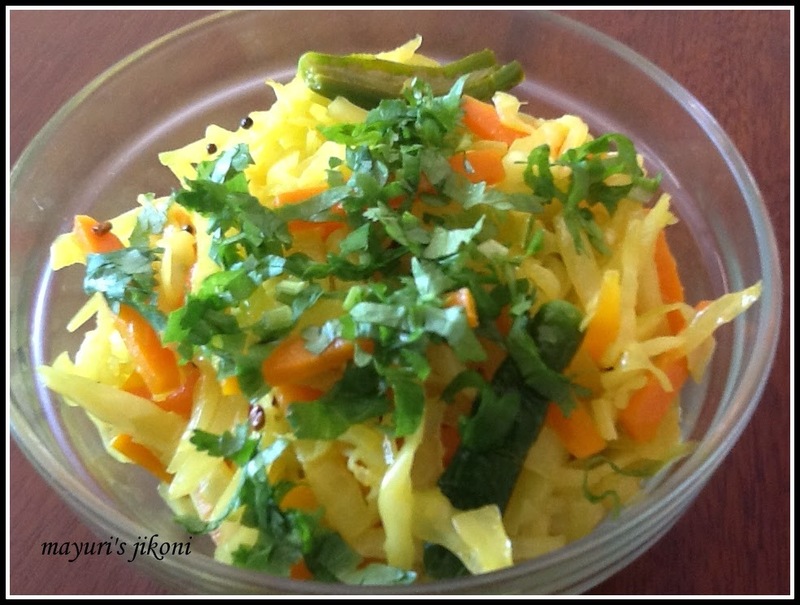 Add a few thin slices of raw mango along with the cabbage and carrots. Reduce the amount of lemon juice. You can add thinly sliced raw papaya or capsicum along with the cabbage and carrot if you like. Make sure you peel the papaya. When you add chillis to the hot oil, be careful as you don’t want the chilli seeds that will pop to burn you. Add the chillis and cover the pan immediately. Remove the lid to add the rest fo the ingredients. Adjust the amount of sugar and lemon juice accordingly to your taste. Sambharo is usually a balance of sweet and sour. If you are going to serve sambharo a bit later, do not cover it with a lid while it is hot. This will result in overcooked cabbage. Heat it up before serving. Nice Write up! Truly Inspiring Speech By Modi..
looks mouthwatering dear..feeling hungry looking at the pic….thanks for linking it to favorite recipes event..